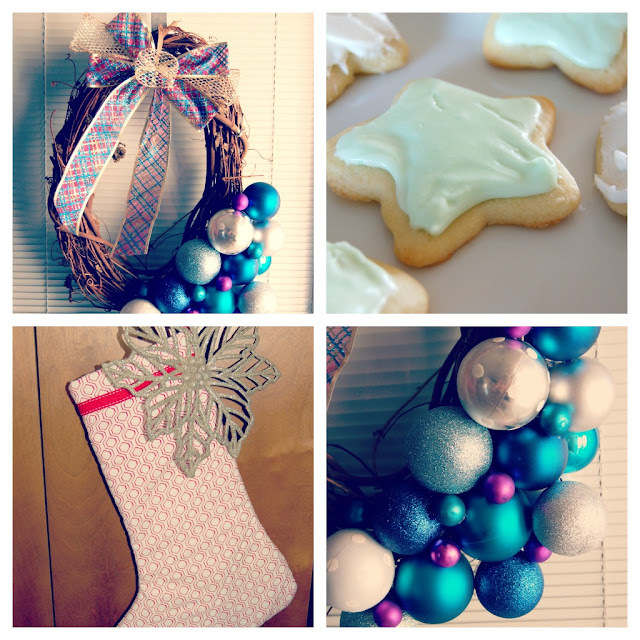 As it is our first Christmas in our new place and with a new baby we have been having a lot of fun bringing in the Christmas spirit with music, projects, and activities. For the first project of the year I wanted to update my wreath on my door. I went on Pinterest and found this idea to use Christmas ornaments with a Fall wreath instead of greenery. I have been loving Christmas ornaments for decorating because of the colors and sparkle that they bring. Seriously, they are everywhere in my house. So when I saw this idea I knew that is what I wanted for my wreath. I got the wreath at Michaels, the balls from the dollerstore, and the bow from Walmart. I'm pretty happy with the result and love looking at it when I pull up to our house. We also decided to make an advent calendar this year (pic above). 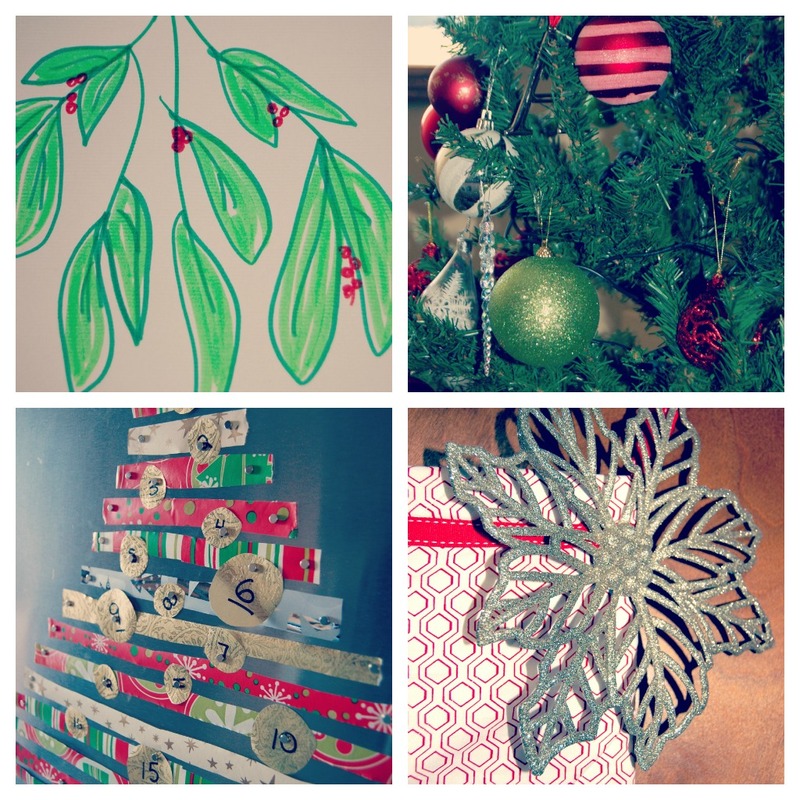 Again I found this idea on Pinterest to make a tree out of stripes of Christmas paper which was so easy! It was my idea to use magnets and put it on the fridge and turn it into an advent calendar where instead of chocolate we have a Christmas activity. So far we have done 3 activities: cutting out snowflakes (that we put up in our bedroom windows), shared a kiss by the mistletoe (I ended up drawing one and put it up), and getting a Christmas surprise (I made Derek some sugar cookies-his favorite). Very simple ideas, but they are little bursts of fun to put a smile on your face. I will definitely do this again next year. We also took Anders to see Santa. I think we had more fun than he did, it was a big milestone for us. Anders didn't really smile, but he didn't cry either. All in all, a fun trip. What are you doing to bring in the Christmas spirit? Any easy decorating ideas?? Oh so cute !!!! i Loved !!! These turned out great! Would you like to follow each other? aw all this stuff is so cute, such great christmas crafts!! 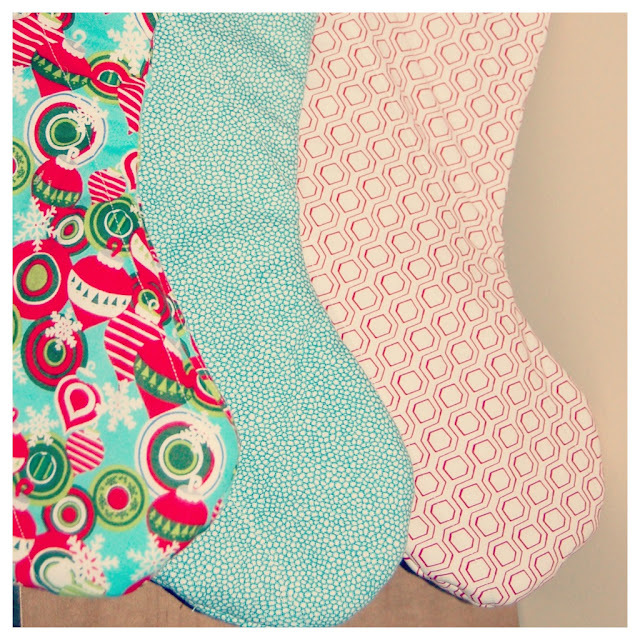 i definitely want to make stockings for my family one day, i think that is such an adorable idea! and the wreath is so awesome!